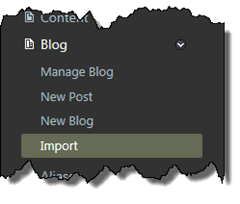 A couple of days ago I started the migration of my blog to the new and shiny Windows Azure Web Sites (AWS - I don't think that acronym is a co-incidence) and the Orchard CMS platform. The whole reason behind doing this migration is that I felt the need for a more modern (and stable) platform than the one I've built from scratch, years ago, and of course that I want to fiddle with some new toys. So, here is a short story on how I did the migration. The first thing was to set up a new Azure Web Sites site. This is done from the new metro-styled Azure portal at https://manage.windowsazure.com/ and all you need to do is click NEW in the lower left corner and select Web Site and then From Gallery. This option allows you to quickly create a web site and at the same time install an App on that site. I chose Orchard CMS, but you can choose from a lot of apps here such as Wordpress, Umbraco, Drupal, Dotnetnuke etc. The reason I chose Orchard is that I wanted a modern and top of the line CMS and that I've been following that project since the Oxite days. It's based on .NET which also makes it very easy for me to extend it. 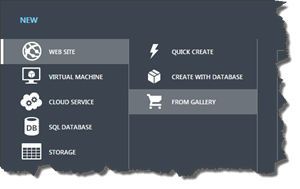 Once the App is chosen from the AWS Gallery you need to choose a name (nnnnn.azurewebsites.net) and a Region where to host it. Then you just apply your configuration and wait for a couple of minutes for the web site to spin up. Once the Azure Web Site is up you will be presented by the Orchard start screen which asks you for information on how to set up Orchard. You enter username and password, choose which SQL to use (embedded or separate) and you will be asked for a recipe (for which I chose the blog one). Click Ok and wait a minute or two and your Orchard site will be prepared. The first thing I did was to start migrating content - the blog posts and all associated images. Since I had my own home brew blog CMS I created a small tool that exported all the data from my old site to the BlogML format. That gave me a 7MB XML file with all posts and comments. The next thing I did was to move all the images from the old system into Orchard. This can be done in Orchard using a very convenient method where you upload zip files with your images. I had some issues with the file size, so I had to move it in smaller chunks of max 5MB at a time. The URLs for my media did change when I uploaded the images and files, so I used a text editor and replaced all the paths in the BlogML file to the new paths. Once all media and files were uploaded I started importing the BlogML data. I added the BlogML module to Orchard which extends the admin interface with BlogML import and export functionality. I had to split my BlogML file into smaller chunks, since it would time out on me if I used to many posts/comments at a time. One reason that I got a lot of timeouts was that I had a lot of comments (approved and unapproved) in my BlogML file and all those were verified using Akismet spam check during the import. The BlogML import feature uses the Orchard Alias function, so all URLs are preserved. There is only one problem right now with modules in Orchard on AWS (I think it's related somehow, since I don't get the same issues/timeouts in my dev env), is when you activate/install a Module your site becomes unresponsive for 5-10 minutes. The only customization so far is a custom theme that you can see right now. It's based on the TimeMachine Theme. Then I did some final configurations like mapping my FeedBurner feeds etc and my site was up and running.